I’ll begin at the end. This wine looked much better after airing and warming in the glass and with a bloody nice mushroom and chorizo risotto which I will take full credit for. But let’s go back to the beginning. An impressive vibrant, yet golden, straw colour. It whetted my thirst (somewhat enhanced, I expect, by several alcohol-free days prior to cracking this bott). I was initially unenthused with the opening of damp straw, lanolin and aged kerosene characters (ho-hum). Then there’s minerally lime and green apples, and I guess there’s a little passionfruit, toast and honey, and some zesty aged lemon rind (you know when lemon gets slightly ‘ripe’ and needs to be thrown out, but not in a bad way really). On the greener side I picked up tomato leaf, some bay, a bit of wet balsa wood. Over time in the glass my Lizzie offered kaffir lime leaf, nutmeg, a touch of fairy floss, and one of my favourite childhood memories of spearmint leaves (the lollies!). And finally my notes reveal a fishy aroma – not like the maritime character I quite like from coastal regions – but, well... a fresh lemon-butter pan-fried fishy-ness. In the mouth this wine is texturally very... well, pleasant. I quite like a white wine with a raw or grainy consistency – short of coarse of course – but just the right amount of interest and layering. I wouldn’t say there’s a crispness to it, but the acid is certainly lingering still. Softish now but would have been pretty steely in its day. Flavour-wise I get lemon & lime, a touch of marmalade and a dollop of mango chutney. There’s zestiness and green apples again, some smokiness, and that lovely natural limey flavour of sparkling mineral water pumped straight from the ground (a favourite past-time of mine in Daylesford). And yeah, just like the Winefront thread discusses, there’s some spritz. No problem. As explained, this wine got better with food and time in glass. Overall though I was underwhelmed – there was a shortness of finish and a lack of weight and zip, generally speaking. I had to work hard to pull the positives. Drink now is my word. Value: What, $12 on special? That’s not bad. In fact, despite the above comments I would say it’s pretty good value. But drink it now. 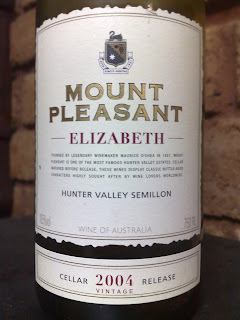 Producer: McWilliam’s Wines – www.mountpleasantwines.com.au – part of the McWilliam family juggernaut. 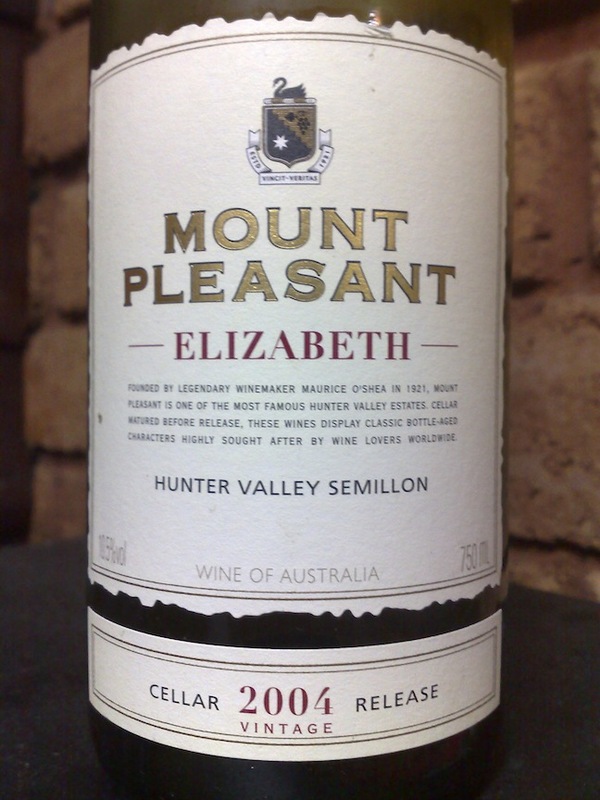 The first release of Semillon (Hunter Riesling) was in 1967. Typically released with four years bottle age. Region: Hunter Valley, NSW – Pokolbin in the south. Renowned for this variety and for wet summers. Vintage: A tale of two colours. White = pretty damn fine (if you picked before the late-Feb rains), red = much sadness and disappointment and hand-wringing.